Dry Skin Defense™ Soothing Cream is a highly concentrated, non-greasy formula that helps moisturize and improve the appearance of dry skin. 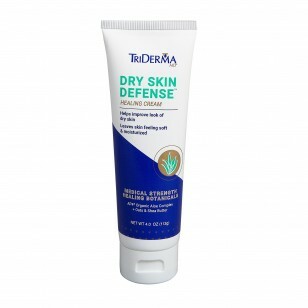 This special cream helps provide look of moisture to help maintain skin’s natural protective barrier. I received a sample of the dry skin healing cream and I used it on areas that had been dry cracked and very irritated and I noticed relief right away and it seems to have heal the area quicker than before with any other product. Got a sample of this and I love it. It is so amazing. Love it so much. I was given a sample of this product by my late Mother for my boyfriends problem with his cracking fingertips. He faithfully uses it now because it is the only thing he has found to heal those sore cracked fingertips. It heals quite fast and we both love it. Apply 1 to 3 times daily. aloe barbadensis (aloe vera) leaf juice*, cetearyl alcohol, urea, arnica montana (arnica flower) extract, isopropyl palmitate, polysorbate 60, beeswax, dimethicone, allantoin, zinc PCA, avena sativa (oat) kernel flour, panthenol (pro vitamin B5), butyrospermum parkii (shea butter), sodium PCA, cetyl alcohol, sodium hyaluronate, tocopheryl acetate (vitamin E), sodium phytate, phenoxyethanol, ethylhexylglycerin.